DailySteals was founded in 2009 by Matt Wiener and is amongst the most popular deal a day sites on the web today; I'd without a doubt list DailySteals, 1 Sale A Day and Woot as the top 3 (but not necessarily in that order). As for the deals, you never really know what will go on sale since the main site doesn't focus on a specific category. For this reason, you can expect to find deals or should I say steals on household items, computers & electronics, apparel and more. For more deals from DailySteals, also see Last Call DailySteals, Home DailySteals, Mobile DailySteals and Outdoors DailySteals. Dailysteals.com currently ranks #34 amongst sites offering online deals -- Muscle and Strength ranks #33. In the General Merchandise category, DailySteals ranks at #21 -- Tanga ranks #20. 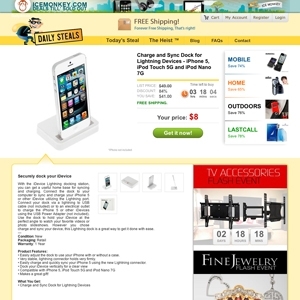 Amongst all deal a day sites, DailySteals ranks #4 -- Mighty Deals ranks #3.